...on why the gospel resurrection stories don't work. 1. What to do with the Body? The Ascension story kills the Resurrection story. 2. Bad theology: What is the value of a 40-day resurrection? 3. The Empty Tomb: Why couldn’t they get the story straight? 4. The Empty Tomb: The apostle Paul didn’t know the story. 5. How can we trust anything in the gospels? 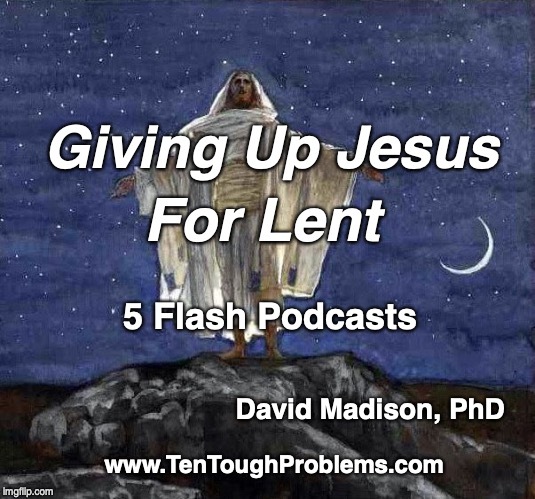 The next series of Flash Podcasts I’m working on: Things We Wish Jesus Hadn’t Said. David Madison was a pastor in the Methodist Church for nine years, and has a PhD in Biblical Studies from Boston University. His book, Ten Tough Problems in Christian Thought and Belief: a Minister-Turned-Atheist Shows Why You Should Ditch the Faith, was reissued last year by Tellectual Press with a new Foreword by John Loftus. The Cure-for-Christianity Library is here.